"A nearly perfect physical environment, Southern California is a great laboratory of experimentation." Carey McWilliams wrote that in 1946, in his beautiful book Southern California: An Island on the Land. 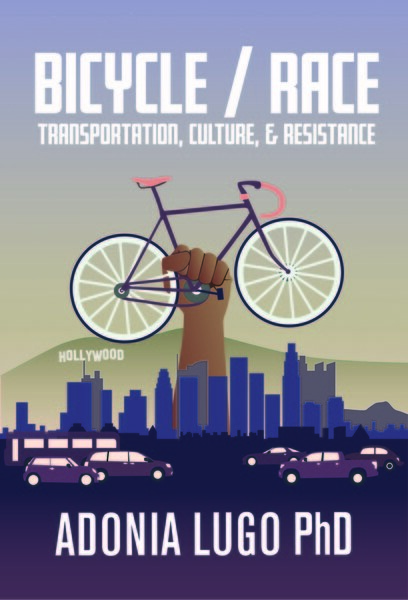 I read that last month, as I was digging through history books to craft a narrative of Los Angeles for my dissertation on LA's bike world. After that, I started noticing the theme of experiment in my fieldnotes, in my grad school papers, in my stubborn insistence on being an activist and an anthropologist at the same time. When I lived in Los Angeles and commuted to UC Irvine by public transit and my bike, I used this blog to demonstrate how I did it, that it was possible. My experiment in carfree regional commuting showed me again and again that the built environment isn't the only barrier to sustainable transportation here; driving is deeply habitual, and it enables drivers to create mental maps of the region that erase distance. At the same time, driving produces distance between the people inside the car and the people outside. Driving keeps you away from other people, and this may be the exact vision of the American Dream that lures people to places like Orange County. Driving half an hour through winding, landscaped suburban highways for dinner? Not uncommon. Treating people like obstacles on a course rather than like other road users in a shared space? Not uncommon. These side effects of driving are destructive to the ecology of the region, both in terms of pollution and in terms of segregation. How can the place where sprawl was born transform itself into a region where walking, biking, and using public transit make sense? In fact, many people live carfree in this region; they're usually very poor. What if we paid attention to how they make this lifestyle work? What if we paid attention to how we communicate messages about one mode of transport being better than others? When I was growing up, nobody told me that walking wasn't okay. My family walked all over San Juan Capistrano, as far as Doheny Beach on the creek trail, or as near as the drugstore where I could buy Thrifty ice cream (black cherry is the best). I got the message that biking wasn't a form of transportation, though, and didn't ride a bike in traffic until after I graduated from college. I also got the message that riding the bus was a symbol of something negative, and was thrilled to take my mom's old car when I got my license at 17. Building the sprawl has been tremendously costly, but we can overcome it through social change. What if people start to think of riding buses and trains as pleasurable outings rather than as punishments for the poor? What if people started supporting the restaurants and businesses closest to their homes rather than driving long distances to eat at cafés that call themselves local and organic? A gated community is a mental rather than a physical construction; all you have to do is prop the gate and life can flood inside. Southern California is already bubbling and hissing with experiments in sustainable living; all you have to do is find some humans and get to work. I've spent the last week and a half in Southern California, returning to the regional lifestyle I led down here for four years. Last Wednesday, I went in my mom's garage and dusted the cobwebs off my folding bike, the one I named the Loose Goose when I bought it in 2008, and rode it down the hill to the San Juan train station. On clear days, the cloudscapes outside the train window reach all the way to the mountains at San Bernardino. When I arrived in Los Angeles, I went down to the subway platform with the Loose Goose, which I'd been advised not to ride due to a recalled part. A young Latino guy asked me about the folding bike, and we made small talk about bikes for a while. He said he had a bike, but it was "gangster" (not a chopper, not a cruiser, I'm not totally sure what he meant). I asked him if he was going to CicLAvia on Sunday. He hadn't heard about it, and speculated that there'd be a lot of "skinny" bikes there (I think he meant either fixies or just road bikes). Then we got on the Purple Line. I walked up Western from Wilshire to Santa Monica to leave my bike at a shop where they could replace the recalled component. On the way, I saw lots of people on bikes. No women, mostly Latinos and Asian men. A Salvadoreño restaurant had a sign in the window that said, "Tenemos paches," which means they had patch kits to repair busted tires. The shop where I left my bike had a Korean owner and Latino mechanics. I asked the proprietor if he was going to CicLAvia, and he said no, but that he'd heard people talking about it. I hopped on the 4 down Santa Monica Boulevard and passed a few more bike shops. There are a lot of people biking in central LA. How many of these cyclists would make it to CicLAvia? When the bus passed through Silver Lake, I saw a new green triangle park with many bike racks and chairs, echoing the public space innovations of Janette Sadik-Khan in New York, and far fewer bicyclists than I'd seen further west. I went to Grand Central Market and got a sandía, then walked over to Broadway and Seventh and found that Clifton's Cafeteria was closed. Permanently? The signs out front were sort of ambiguous. I'll feel sad if they get rid of the Brookdale décor. Then I walked along Pershing Square to the public library. I went up and sat in the funny suspended glass hall on the top floor, where you can hover over the newer wing and watch everybody.